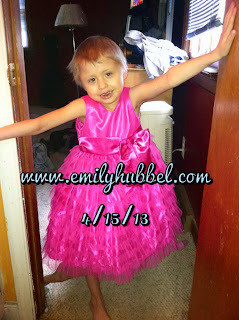 Tomorrow Emily is scheduled to start Round 4 of the Avastin Trial that she has been on. She has clinic to check counts to make sure she is good to start, and if she is good to start, she will get pre-meds and then the Avastin that runs over hour and half. She continues to mostly eat pretty well, play and run around and just have a good time. We really have been enjoying home together as a family and enjoying one another. Dad and I even have date night Saturday evening and enjoyed having time with one another while my mom stayed with the girls. Last weekend, we had a weird day where Emily was throwing up, but there was no explanation as to what was causing it or why it was happening. This past weekend, Emily wasn't eating much Saturday and Saturday night she was running low grade fevers and then over night she had some pretty high fevers. Sunday low grade fevers and if she had any more high fevers, we were going to take her to the ER. Thankfully she didn't, but again all of this happening with no explanation as to why. She also complained of her toes hurting, knees hurting and her head. All of which throws her dad and I to worry. Its just a reality for us...to worry, to think and then worry some more, we worry about the little things. Even when things are good and she is happy and running around, we still worry. We can't help it. Its the reality we live in... Why is she getting sick? Why is she having fevers? Is something happening in her body that we can't see? However we take the days when she is feeling up and enjoy and play and have fun, we will never allow the worry to take us down. I don't update often, because we often have these thoughts in our minds and they are hard to just not think about. I try to update when big milestones are coming up or are happening so people who don't follow facebook, know what is going on. Today we emailed the doctors and nurses in Michigan to let them know Emily is starting Round 4 tomorrow and to go ahead and schedule scans after day 15, which will be April 30th. We also explained about what had been happening and that while we hope it is all just normal things, we still worry. The nurse replied and said Emily was slated to come for scans May 20th, which will delay Round 5 starting should everything be ok to move forward. I explained that and she emailed back that Dr. Sholler moved some things around so that we could come for scans during the week of May 6th. So now we just wait for emails with the times and actual dates during that week. We are thankful that Dr Sholler understands that us families worry when unexplained things happen as they have and that we worry it could mean the worse. Emily overall besides the unexplained things happening, has been doing great. Honestly she has been doing awesome, always has the great smile. She is enjoying camping with Dad and I and family, has been doing really well with the Homebound teacher and just enjoying time with family and close friends. Dad and I have noticed Emily has gotten very clingy to us, but it really is just Emily's nature! She is gaining weight and doing awesome. We are proud of the fight that she continues to fight on a daily basis and the smile that she always carries and the love that she has for her family. We do ask that you think about the families who lost loved ones or were hurt in Boston. Its a shame that we live in a world that we have to worry about these things happening, but something I have learned when bad things happen like this, there are some people in this world that you are so happy to have met and have such great people in your life.